This year, as children returned to school and summer vacations ended, September brought almost tropical weather to Eastern Ontario–it persisted during the evening with balmy nights and then, with little warning, switched to cold, sweater evenings. Apparently we will be having more temperature fluctuations this Fall, with a dip in temperatures by the end of the month, followed by a warmer period before winter. 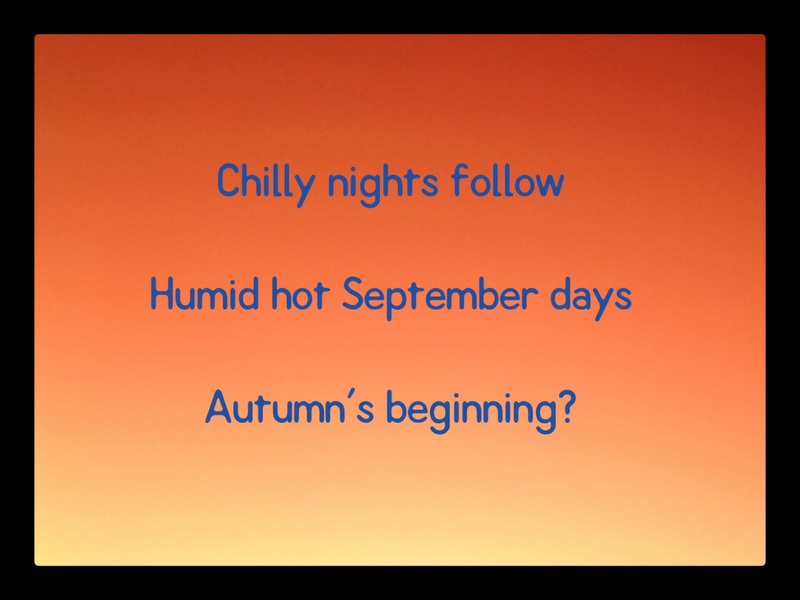 Humid hot September days, Autumn’s beginning? This poem was written in response to Ronovan Writes Monday Haiku Challenge #62. To read more haiku using the prompt words “Start” and “Hot” please visit the Prompt Post. 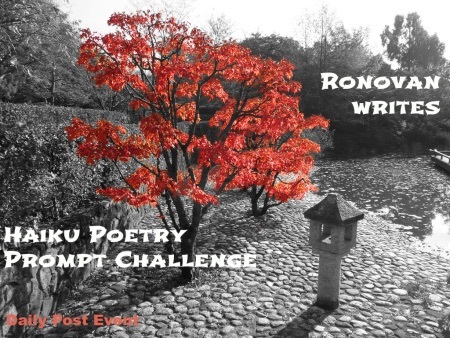 There Ronovan offers opening haiku and explains how to participate; links to haiku contributions are posted in the Comments section. On Sunday, September 20, visit RonovanWrites for a Roundup with links to all of this week’s entries plus an informative and entertaining commentary. The evening and nights follow your words and speak for Autumn and the loss of Summer. Winter always follows so soon after. Sounds like you’re shifting into cold weather mode–can feel it happening to me too. Time for soups. Despite that I think we’re going to have another flip into warmer weather before winter–makes you versatile, keeps you guessing. Yes, Wednesday during the day 75 F. At night going down to 49 F. Do hope for a warm Autumn for us all. A touch of rain would be nice, especially at night while getting ready for sleep. I just love the sound of rain while drifting off. So soothing. I love to look at snow falling but you can’t hear it. It was warm and sunny yesterday but today is another story. Autumn is certainly on it’s way. Thankfully temperatures have cooled around here and it feels like the Fall I love. I love summer, autumn and spring, but not too keen on winter!